It is my first time painting a bunch of bananas. I don't know why I didn't paint bananas before. Perhaps I was shy away from the complicated shapes due to difficult perspectives. When I painted this one I was only observe the abstract shapes obtained from measurement. It was chaotic for a while, but it started to make sense after I got the value correct. From my recent small paintings, I try to paint something I have not painted before, or not often. I try to improve my skills to paint new objects. I don't know if I am right, but I feel high key is more suitable for small paintings. My paintings are predominately low key. I like using dark background and let the center of focus shine. However, I didn't realize the display effects in an actual interior design situation. If I place a small 6" x 6" on the mantle or on a desk, the color (or the value) of the interior surrounding the painting is usually brighter than the painting. Therefore, the small painting looks like a black hole if we don't illuminate it with a designated light. So the environment-to-painting contrast will overwrite the value contrast within the painting. On the other hand, high key painting is definitely has the advantage, because its larger bright and color areas will show the design of the painting more pronouncedly. In addition, colors show better on high key paintings. So the painting can be the center of the interior. I don't know interior design. All the above is my gut feeling. If you have collected my low key small paintings. I recommend you setting up a light for them to show better effect. My today's painting is a high key one. Does it look a little brighter? The second demo was about painting flowers. I feel freer now when I deal with flowers and leaves. Demo is time limited. To complete a painting within two hours is rather hard. After practice, I feel more confident and the painting is getting more complicated as well. Now my second workshop is over. I hope all workshop artists keep practice what we have talked about. I want to see progress showing on the canvases on all of you. Thank you again. My second workshop started today. I want to thank all the artists for coming. I am very happy to see more and more artists attending my workshop the second and even the third times. I will try to improve my teaching as much as possible. This is my first demo. I really enjoyed painting the grapes. A cluster of grapes is a type of texture instead of a group of round fruit. I didn't render them one by one, but suggest them by using high lights and silhouette. It was such a fun painting them. Painting a white rose is rather challenging, but it turned out all right. This is my second demo in my Austin workshop. This workshop is over now. I hope all artists who attended have enjoyed those three days. I am taking a break today and tomorrow my second workshop will start. This is my first time piggybacking two workshop together. I am looking forward to seeing how it goes. Today, I started my 3-day workshop in Austin. I want thank all the attending artists. I feel very excited about this workshop. It is the first time we (Song and I) combined organizing and teaching together. I want thank my dear wife Song working very hard putting this workshop together. It is a new milestone in my art career. This is my first demo. The photo is not perfect, but you got the idea. I got this old alarm clock in Beijing last December. It probably is older than I am. The time has been frozen who knows when. You know this clock did the same thing as I do daily paintings. Part of my motivation of doing daily paintings is to freeze time. Every painting I did recorded my existence at a specific time. Now with this painting, I froze time twice. I am happy to let you know that I am going to go back to Putney Vermont and teach a 3-day workshop on March 28 to 30, 2012. The workshop location will be at the studio where Richard Schmid and the Putney painters paint regularly. I am so honored to be accepted as part of the Putney painters and teach at this legendary place. This workshop was confirmed not long ago, so we still have a few openings. If you are interested in attending, please contact the workshop organizer Penelope Simpson for detailed information and signing up. I hope to see you in the beautiful Vermont. My today's painting is 12" x 16" gallery painting. It took me several day to get it done. I really enjoyed the subtle grays on the bronze. Newton's First Law says: Every object in a state of uniform motion tends to remain in that state of motion unless an external force is applied to it. This law does not only apply to physics but also apply to daily painting as well. If we keep our painting going regularly, it tends to keep moving. Our job is to be alert to those "external forces". In this modern fast speed world, our life is not very livable any more. The "external forces" are ubiquitous (Gosh! I even can use this word). We have to apply our internal force to balance out and keep the momentum going. It is hard to do, but we don't have a choice. I did this small painting yesterday, trying to understand the Richard Schmid style. If you follow my blog, you may have noticed that the major art activity I promise I will do in a daily bases has been actually missing for almost a month. That activity is my small daily paintings. Daily painting is the core of my art. But gradually my other art activities have taken over my time. In my mind, it is very clear. I will not give up my daily painting no matter what happens. I know perfectly that without daily painting, I will not have my art today. Now my painting time is getting less and less, but I must keep doing my small dailies. When I started this small rose painting, I was really have no energy, and my mind was blank. But I know firmly: I must paint. So I did. and I am glad I did. This wonderful portrait was done by the successful young artist Fongwei Liu. His is exceptionally good so the Academy of Art University in San Francisco hired him to teach oil painting at the graduate level immediately after he received his MFA at the same school. I met Fongwei many years ago and learned a lot from him. 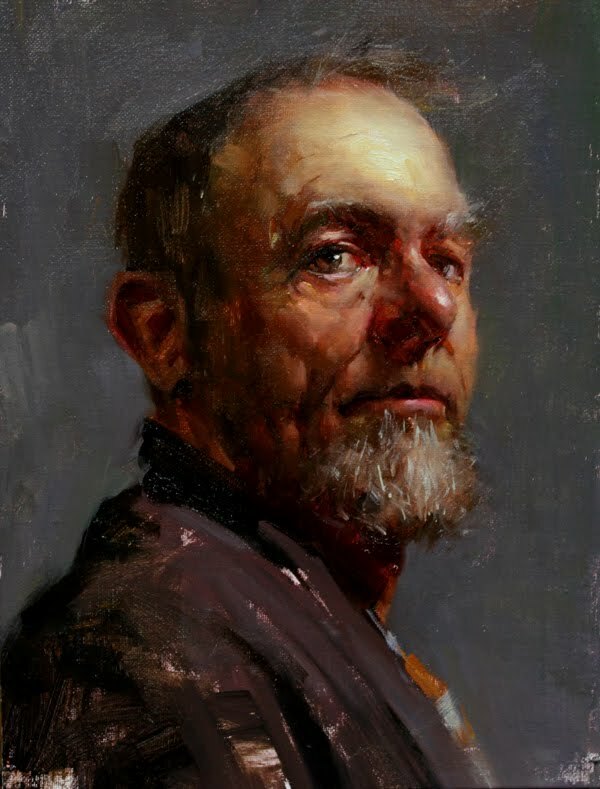 If you like to paint portrait and figure, I have a great news for you: Fongwei will coming to Austin in May to teach a 3-day portrait and clothed figure painting workshop. To get more information about this workshop, please check Fongwei's workshop flyer and sign up. Got up early this morning, drove about five and half hours, I have arrived a small town in East Texas called Mt. Pleasant. I did this demonstration at Mt. Pleasant Art Society. I want thank the Art Society for this opportunity and all the artist friends for coming to see my demo at this Super Bowl Sunday. I spent about two hours on this 12" x 16" canvas. I think I have progressed. For two hours I usually can only do a 6" x 6". I haven’t posted for three days. You might think I have fell in a crack somewhere during my travel. Well, I have been back home for several days, but it happened to be that this week is my technical consulting week. I changed my hat and jumped into the morning traffic jam after just a short sleep. I felt like a single actor playing many different roles on this live (or life) stage forgetting totally who I am. Somehow I couldn’t resume my old routine of working during the daytime and painting at the night. So I didn’t paint for several days. However, I want to keep my painting posts flow, I put one of my older paintings here to share. I did this one when I was in China last November. The flashlight and boxed ink bottle are at least 35 years old. I used them when I was in high school. They brought me so many memories of the old days. I felt I am still the young boy in my mind, but I am very different now. However, those items in the painting haven’t changed much.